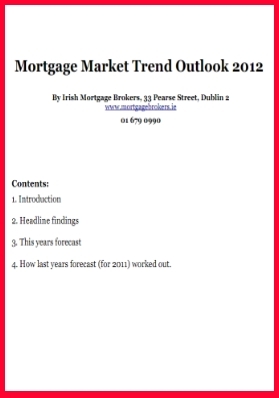 We have made a few more bold predictions in our ‘Mortgage Market Trend Outlook 2012’ and reviewed how wrong many of our 2011 forecasts were as well. 1. That mortgage lending bottomed out in 2011. 2. That IBRC may take on some tracker loan portfolios to de-risk state owned banks (as the state already owns these loans entirely anyway). 3. That rates for existing AIB borrowers will have to go up but that for new borrowers rates may come down with changes to how prices are charged depending on risk of the proposed loan. 4. That deposit rates will start to drop. 5. That up to 25,000 mortgages will be deemed ‘unsustainable’ and that the ‘won’t pay’ contingent of arrears cases may be as high as 1 in 5. We hope you enjoy this report, we in turn hope that we get some of the calls right! The report link points to an Indo opinion piece rather than your report.